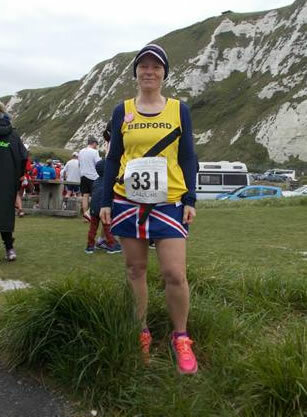 I decided to do this marathon as I hadn’t run one in 2 years due to injury (and putting on lots of weight! ), it was also on my Birthday and St Georges Day so felt a bit special. 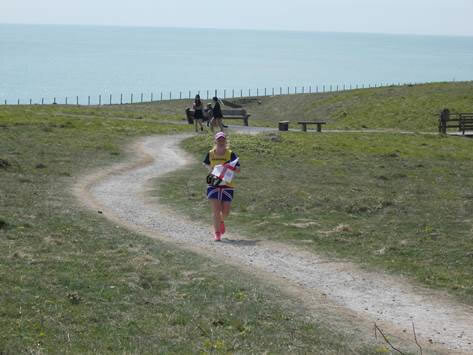 It was a 7 lap course and each lap included about 2 miles of seafront which was really quite lovely with the sea glistening and the white cliffs of Dover in the back drop. The rest of the 3.75 mile laps were made up of gravel and trail paths of quite hilly terrain. It was a very small friendly field of runners with a lovely relaxed atmosphere. It really was very well organised. Proper toilets at basecamp made it feel very civilised! The feed station at base was stocked full of cake, crisps, sweets and anything yummy and I even had time to stop for a quick chat after each lap with the lovely ladies who had made cakes for us. They sang Jerusalem at the start and Happy Birthday to me when I finished! On our last lap we were given England flags to wave as we crossed the finish line (well as we hobbled across the finish style/gate). We were rewarded with the best goody bag ever, 3 large bars of chocolate, crisps, pin badges of the St George flag and a can of lager. And the best thing….my car and family were right there, no trying to wade through crowds looking for the baggage way off in a distant lorry somewhere. I was not convinced I was going to enjoy 7 laps but it worked for me.